Do you know what you spend per day on average? Are you spending more or less than you used to? Why is your spending going up and down? How does your daily spending impact your long term financial goals? Understanding your daily spending can help you fine-tune your budget for long-term success. 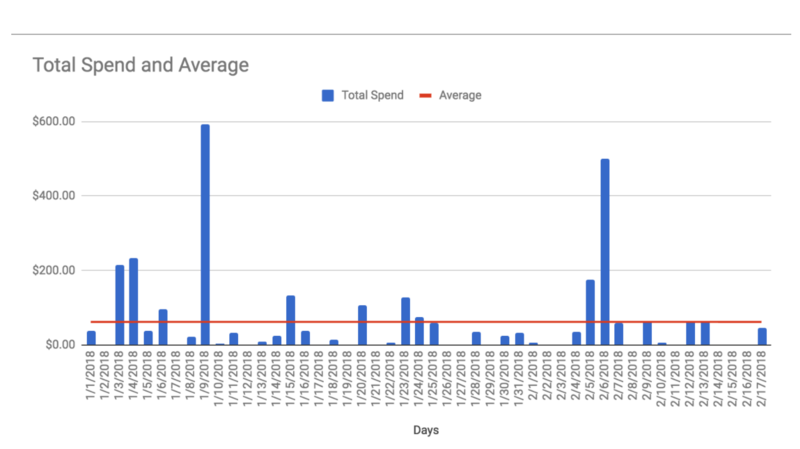 To make this easier, Tiller Money has created a quick way for you visualize your average daily spending trends in a “Spending Trends” Google Sheet. Copy the URL of the sheet. Click here to open a read-only version of the Spending Trends sheet. Paste the URL of your Tiller spreadsheet into the bottom of the dialog that pops up. Choose select and you should receive confirmation that the sheet was successfully copied. 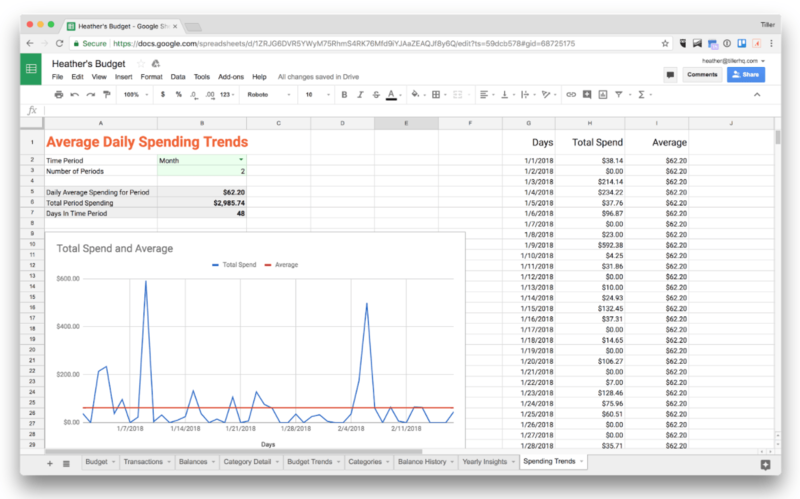 Navigate back to your Tiller spreadsheet and rename the tab from Copy of Spending Trends to Spending Trends or whatever you’d like to name it. 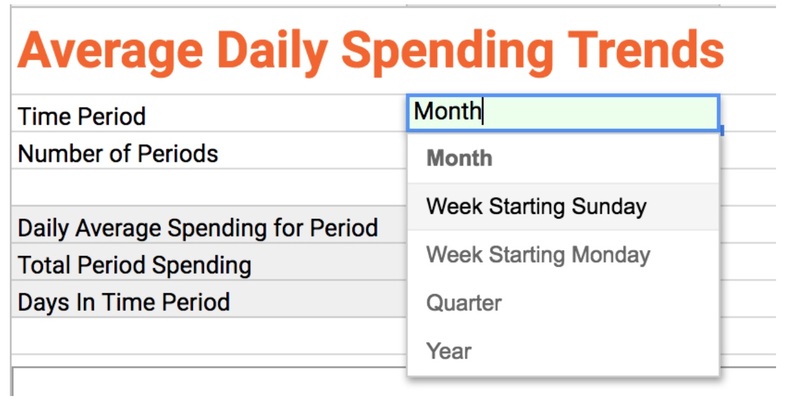 Once you’ve added the Spending Trends sheet it should immediately begin working. There isn’t any additional configuration required, but there are some things you can do to customize the sheet. You can choose to review your average daily spending across weeks (starting on Sunday or Monday), months, quarters, or years. You can choose how many periods you’d like to be displayed in the chart. You can adjust this at any time to review various time periods and get a sense of how your average daily spending is changing. After a time period is chosen and the number of periods is set, you’ll see the average daily spending per period amount, total spending in that period, and number of days in the period. Below that, you’ll see a chart that shows your spending for each day across the number of periods, and period type chosen, against your average for those periods. If you’d rather see your daily spending against your average daily spending as a bar chart with a line you can edit the chart and change it to a combo chart. There may be some other charts you can experiment with, but the line chart and the combo chart seem to work best. You’ll get a pop up that asks whether you want to include the hidden data in the chart, and you’ll need to click “include data” for the chart to continue to work with the columns hidden.